This is the new dress I bought in asda last night, it was only £12 and is nice and light. I wore it in work all day today and it was very comfy. I must say I bought it because it matched the cardi I bought from H&M. The print is very nice on this and although I have lots of floral dresses none of them are quite like this. I would say its more Hawaiian floral than my usual English garden.Have you had any cheap supermarket clothing buys recently? I went to Bristol on Monday to see Frankie and the Heartstrings again and I had a fab time. It was a Topman student CTRL party but I managed to sneak in without a student ID, hurrah! The gig was in The Fleece which is one of my favourite venues, nice and small with a high stage so you can see everything. The band were in the same hotel as us which must have been rubbish for them because Bristol Central Travelodge was proper grotty, the cream lampshades were so dirty and it was really shabby. It was cheap though... We came downstairs in the lift and when the doors opened the band were standing there, promise I wasn't stalking them or anything! I tried to act cool but I was probably a complete dork. Me and Emma got some Percy Pigs for the journey, I love them! I tried to do an outfit post before the gig but the lighting in the room was awful so I only have a dodgy photo in front of the camera. I wore my fave h&m dress and my new h&m cardi. Do you think Frankie looks like a young Morrissey or is it just me? I'm in work all day tomorrow and Saturday and have an assignment to write so my weekend isn't going to be very exciting :( I do get a week off for Easter soon though and I'm planning a little trip away, maybe to Manchester. What are you up to this weekend? Love the print! Sadly in Australia we don't have dresses at supermarkets;) which would be great for when I go on shopping bans - my exception is always anything that can be purchased at a supermarket. Oh very nice dress. The colours in the dress and cardi are perfect on you. 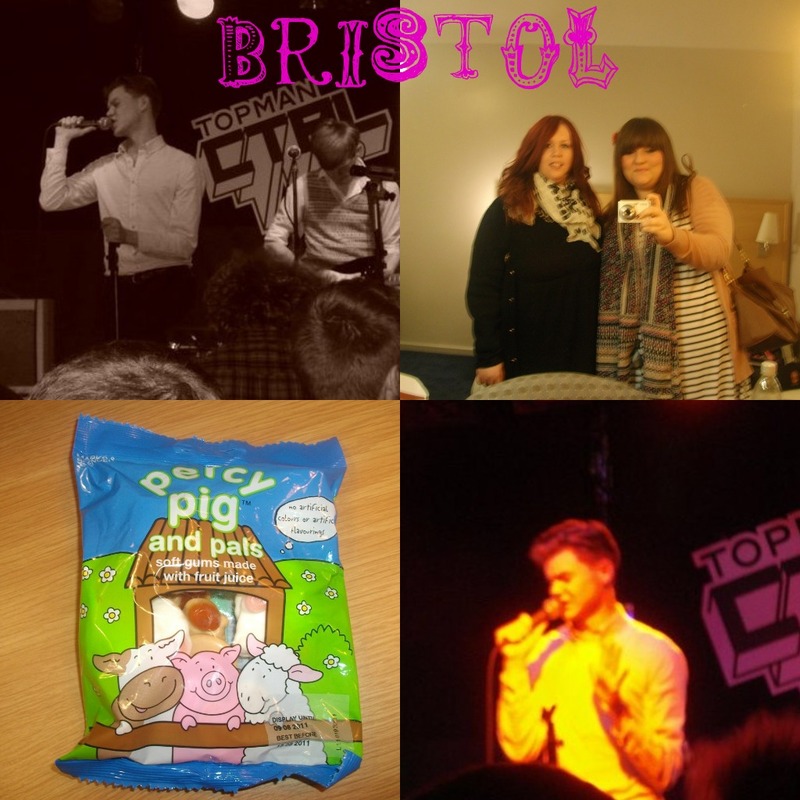 Glad to hear you had a good time in Bristol at the gig. I definitely see the tropical/Hawaiian vibe to this print! It's lovely paired with your cardi, and what a steal of a deal on the dress! Love the dress, it's very pretty on you!! No plans for the weekend yet! hope it's sunny and warm !!! So glad you had a wonderful time at Frankie and the Heartstrings, and that about the hotel, how cool is that! I would have been so embarrassed and lost for words. Lovely dress, maybe I'll have to buy it haha. The Fleece, I love that place! @Helen- I know, poor band. They've been on the road for a year now, must be sick of Travelodge. Your night out sounds fun. I sort of see the young Morrissey thing but ugh, my thing for Morrissey is absurd hehe. Do I still love you or is it just lust? Pen Pal Exchange is now closed!